The biggest and most successful battle for the Boer troops was the battle of Nooitgedacht. General-major R A P Clements had a contingent of 1500 men, 9 canons and over 100 wagons in the Moot. They were busy plundering farms, burning houses and catching and sending women and children to the concentration camps. On the 8th December this large force was camped at the foot of the Magaliesberg on the farm, Nooitgedacht. The farm belonged to an English family, who knew the surrounding area well and could supply the British with the necessary intelligence. Clements, however chose a bad place to set up camp. It was just under the highest peak of the Magaliesberg. He sent an outlook corp and guard of 150 men up a very steep gorge to the top of the mountain, where they took up positions on both sides of the gorge. General de la Rey and the newly appointed General Jan Smuts noted the set up of the camp and the isolated outlook posts, from their hidden vantage position further west in the Moot, and made their plans. During this time, general C F Beyers was in charge of the Boer troops in the Northern-Transvaal and was busy approaching Bethanie, north of the Magaliesberg. He had 1500 men under his command and thus the Boers jointly had a force greater than that of Clements, something that seldom occurred in the whole of the war. However, between the two Boer forces, General Broadwood was stationed with his cavalry. His informants advised him of Beyers’ presence. Beyers expected this and told the local community, who were quick to spread the news, that he was busy approaching Rustenburg. Broadwood, who was known for his impetuosity, galloped at full speed to Rustenburg, forgetting to warn Clements. After his deliberation with De la Rey, Beyers split his force into six commandos, four of which would overcome the guards on the mountain from the west and north-west. These commandos were under the command of Commandants Kemp, Marais, Van Staden and Krause and Beyers himself. Early in the morning of the 13th December they moved up the northern slope of the mountain. The fifth commando, under commandant Badenhorst went south along the foot of the mountain, to attack the isolated mounted division of Clements’ army. 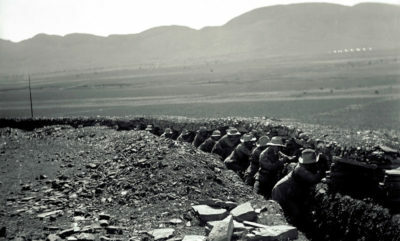 The sixth commando waited behind near Breedtsnek, in anticipation of Broadwood who would be returning from Rustenberg. De la Rey brought his troops near the main force of Clements’ troops, whilst Smuts moved to the south east, to cut off Clements’ retreat. Beyers’ attack is described by many a historical writer as one of the most able and courageous attempts in the war. Due to a lack of natural cover and exhausted after two sleepless days and nights, the troops fell flat on the ground when the British fired at them and for a time ignored their officers’ command to attack the British. Deneys Reitz describes how the British’s provocative jeering eventually angered the Boer troops so, that they suddenly rose up as one man. They were so close by this stage that gunfire, gun butts and bayonets were used and some of the English were thrown off the cliffs. By 7h00 the Boers were in control of the mountain and attacked the camp from the cliffs. Pandemonium broke out and although the British mounted troops initially drove Badenhorst back, the entire British contingent fled. Broadwood heard the shooting and heliographed the outlook post to find out what was going on. The Boers, who were now in command of the heliograph on the mountain, answered: “Everything in hand. No help needed.” Broadwood’s fears therefore were laid to rest. In the mean time, De la Rey hesitantly joined the fight. This was uncharacteristic of De la Rey and it allowed Clements time to get his retreat under control. Smuts’ efforts to cut Clements off were also unsuccessful. The Boers, in an undisciplined manner, entered, plundered and set the camp on fire. After the initial loss of a third of his men and nearly all his supplies, Clements escaped via Rietfontein near the Crocodile River to Pretoria. For many years, the Jennings, Sanders and Hinds families, owners of the farm, maintained the graves of the English soldiers until they were moved to the Garden of Remembrance in Krugersdorp. At the foot of the mountain stands a small monument, which was erected by General Clements at the original graveyard site. The grave of T van Zyl is still on the farm. The other Boers were laid to rest at Breedtsnek.